Hit the highway out of Las Vegas and spend the day touring the Grand Canyon and Hoover Dam. On this day trip you'll have four hours at the Grand Canyon, with the option of walking on the popular Grand Canyon Skywalk for panoramic 360-degree views. Leaving Las Vegas behind, you'll enjoy an approximate 15-minute Hoover Dam Photo Stop from the pedestrian walkway along the new Hoover Dam Bypass Bridge! You'll then travel through the ancient Joshua Tree Forest en route to the West Rim of the Grand Canyon - the road gets a little dusty and bumpy here! Once at the West Rim you will have 3 hours of unguided time at the Grand Canyon. It's up to you to spend as little or as long as you wish at each of the following attractions. Travel time between Las Vegas to the Grand Canyon is around three hours each way. Your driver will provide an expert commentary along the way, returning you to Las Vegas in time for a night out on the town. Motor coaches are climate controlled and equipped with restrooms, reclining seats, video monitors and over-sized windows. Why not complete your Grand Canyon experience with a thrilling helicopter flight to the floor of the Grand Canyon. You will be flown 4,000 feet to the base of the Canyon where you will board a pontoon boat for an approximate 15-minute ride on the Colorado River. 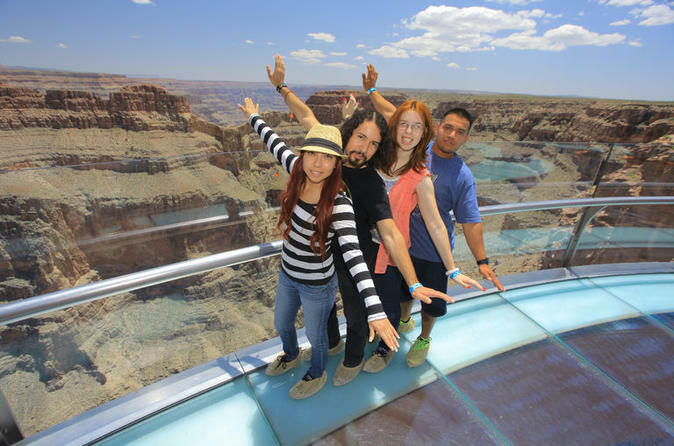 Enjoy the Grand Canyon Skywalk (if option selected) and the panoramic view. Special Offer - Book with us and save 36% compared to another travel site! - Book Now!